During a visit by CIKA to the Macarthur and District Lions Club early in 2011, Glenys Sharrock of the Bessiebelle Quilters introduced herself to CIKA President, Sandra Lehrer, offering to donate quilts to be used in CIKA raffles. A subsequent meeting at the 2011 Old Time Wood Days provided an opportunity to learn more about the Bessiebelle Quilters which was formed in 1991 after a group of local women had been meeting informally for some years and had been learning their craft from a local identity. 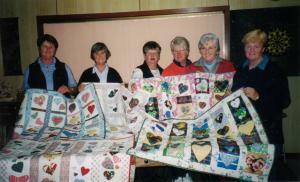 Once the group started meeting regularly they concentrated on perfecting their patchwork skills and when they were confident in their technique they made contact with Jacqui Malseed at The Royal Children’s Hospital who encouraged the group to make quilts for children who were recovering from cancer treatment at home. From time to time members of the quilters move on and prior to their move the group produces a combined effort on a special quilt that reflects the time spent and the friendships made within the group. 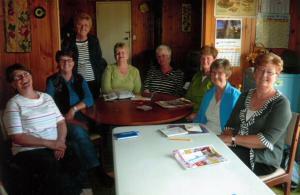 Left to Right: Jan Petersen, Cheryl Hill, Heather Rowbottom, Diane Cowland, Carmel Jasper, Gail Down, Glenys Sharrock and Sandra Boshma.